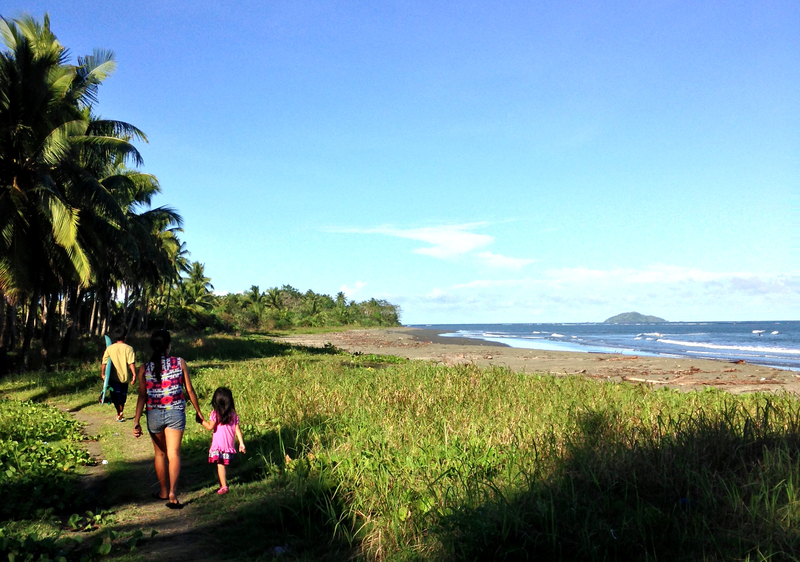 In the wake of typhoon Yolanda, we decided to proceed with our planned November surf trip. We ditched our intended surfboard delivery for Balikbayan boxes full of relief goods to typhoon victims, the contents of which were donated by friends and supporters of the Balikbayod program. One box was dropped in Cebu for dispatch via ABS CBN Foundation & the other was dropped in Manila for the Manila Surfer’s Association who were helping victims in the surfing area of Guiuan, Samar. It had been 2 years since visiting our programs on Siargao Island, Philippines and there were only 2 weeks planned to start new programs in the Southern Philippines. The map shown charts the course I took for the surf trip. 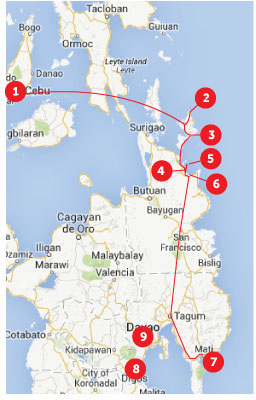 You can see slightly above the red path are the locations of Guiuan and Tacloban which were in the direct path of the typhoon and suffered massive destruction. 1) Flying out of Cebu, we were able to see supplies of relief goods that had arrived and were ready for dispatch. In Burgos, we picked The White Sands Paradise Beach Resort as our home base. *If you are a surfer finding yourself waiting on waves to shape up in Burgos, you can talk to Alan about volunteering your time to surfboard repair if you have the skills to fix some badly damaged boards (de-lams, or missing chunks). Traveling surfers: our Balikbayod programs are always in need of tropical warm water wax, so bring extra bars to gift if you can. We met with our after-school program kids and their quiver of boards, most badly damaged. They produced the last tube of Suncure given to them and it hadn’t been used since 2 years ago. We realized we overlooked really teaching them how to fix the dings, so the following day was a surfboard ding repair lesson for the older kids. By the end of the day they were patching and fixing dings all by themselves. We also lead a kids meeting to teach making group decisions through secret ballot voting. They voted to sponsor 2 girl members in their volleyball tournament with group funds over repairing a surfboard. Did a check-in after restarting the after-school board borrowing program we founded in 2008. Two of our lead surfers in charge were away, directly working on relief projects for the typhoon in Guiuan and Tacloban. We stayed at Matanjak Guest House and La Luna Island Resort next to Buddah’s Surf Resort, where we found ourselves in the company of international travelers from places like Russia, France, England, Australia, Germany and the US, from novice to expert surfers. Buddah’s is also taking collection towards the funds to help Guiuan. A great way to help after Typhoon Haiyan: http://siargaosurf.com/help-samar/ Help keep the aid coming and support Guiuan, Samar where the Philippines surf community is working to take part in rebuilding projects for 2014 and we also aim to start another Balikbayod Program there to help the children enjoy their waves. The shipment of 6 surfboards we packed and shipped in September had reached General Luna via LBC (despite the typhoon!) bringing the borrowing total of boards back up to 10. Our teacher in charge, Mam Pitang, was contacted and registration was re-opened to kids who want to sign up for our board borrowing program, which requires proof of good school attendance. On a tight schedule, I had 3 days to find & meet surfers & teachers to be in-charge of the new Balikbayod programs. Led by Loanne, my gracious guide to the area, surfing was first on my agenda when I arrived. With no surf gear, I quickly met some of the locals, namely Brendo who loaned me a board to go straight to the beach with. After a couple days of showing up on his doorstep to borrow boards and surfing with his nephews, I popped the question to him about leading the program. I brought printouts of our operations manual and explained to him what the program was hoping to achieve. He agreed, and now we have Brendo Torejos as our new surf coordinator in Cantilan, with our area coordinator in charge of the 3 locations, Loanne Huelma. Ayoke and Lanusa were quick day trips to meet and greet the local surf community and find those to be surf coordinators. Bombom in Lanuza was selected and in Ayoke we visited the only elementary school and met with the teachers after meeting with a surf family who were willing to oversee the new board borrowing program. I travelled overnight by bus from Lanuza to Mati switching busses 3 times. It was a 12 hour trip in total and I arrived in Mati 6am. Thanks to Katya Marzo, a friend via Facebook who recommended we should visit Mati and start a Balikbayod program there, arranging for me to meet George Plaza (Kuya Jun). He whisked me away to have local corn coffee in a cafe and then we were off to Amihan Surf Camp. This was the greenest group of surfers I have come across in my Philippines travels. 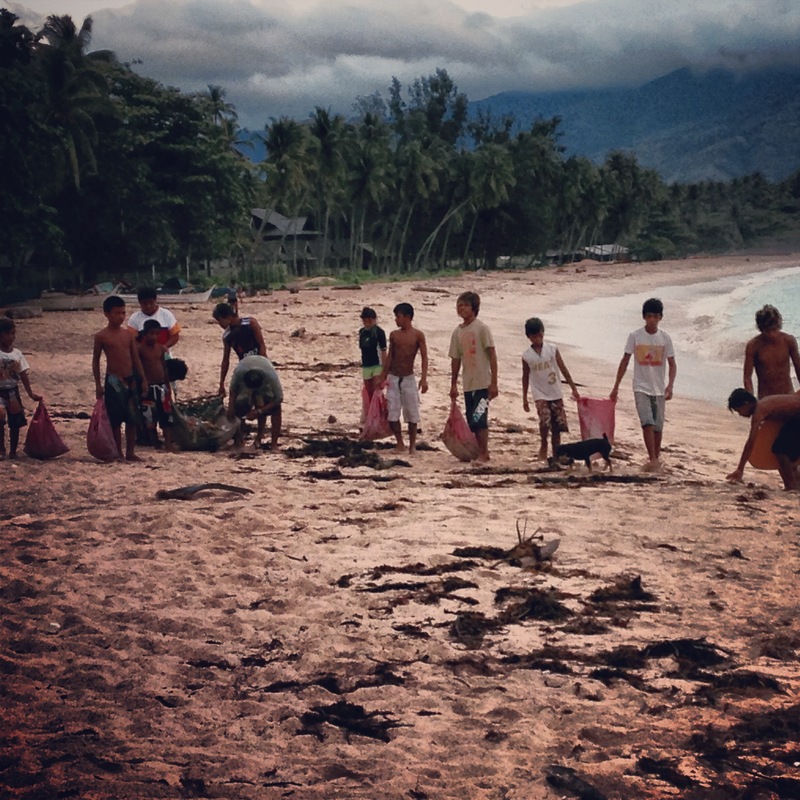 They protect the pawikan, which are sea turtles, that come and lay eggs on their beach by doing weekly trash clean up and educating local students and tourists on the effects of humans negatively impacting the environment. After a big group meeting, they agreed to allow Balikbayod program to their spot as Kuya Jun for the surf coordinator. Welcome to our newest surfing family in Mati! So next time, come and join us on a surf mission to spread the hope and fun. Email us at info@returningwave.org to sign up for our email newsletter and get notified of events. Thank you for your continued support!